Preheat a waffle iron. in a large bowl whisk together flour, baking powder , sugar and salt. In another bowl mix eggs, butter and milk thoroughly. Combine with a wire whisk or wooden spatula. 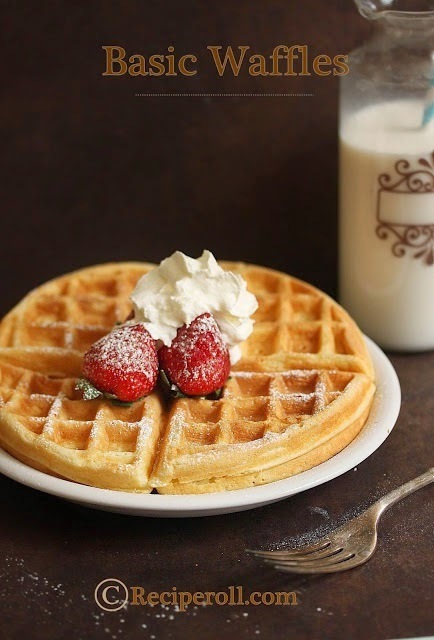 Heat the waffle iron until the indicator shows its ready to use. Pour the batter about two-thirds of the grid surface. Close the lid and wait about 4 minutes or till the indicator shows its ready. Serve warm with maple syrup and fruits of your choice.